The magic of roasted vegetables never ceases to amaze me. A single ingredient, tossed with a bit of oil and sprinkled with salt, can be transformed into a robust, complex dish. I've only recently started cooking this way, though. I'd gone for many years only occasionally using the oven. I've always been drawn to preparing meals on a stovetop, finding the quick results of sautéing more satisfying than the longer process of roasting vegetables (as I type this, I realize it's evidence of how impatient I can be). However, when my schedule allows it, I prefer this slower method, letting flavors develop. This broccoli salad pairs the deep caramelized notes that form from roasting with bright citrus. Creamy labneh is both rich and tangy that turns this into a more substantial side. 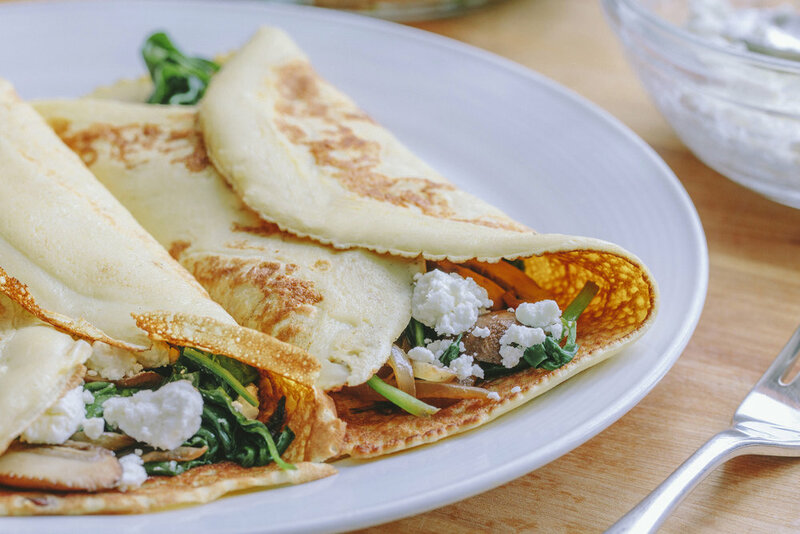 If you only have a thick Greek yogurt available, that'll also work. Preheat oven to 425 degrees F. Line a large baking pan with aluminum foil. Place broccoli in a mixing bowl. Drizzle 2 tablespoons olive oil over broccoli and toss to coat. Transfer broccoli to baking pan, making sure to spread it out, so the florets are flat on the pan and season with salt and black pepper. Transfer to the oven and bake for 25-30 minutes, flipping halfway through, until edges have browned. To toast the pine nuts, heat a small saute pan over medium-low heat. Add pine nuts and cook, stirring frequently, until golden-brown (keep a careful eye on them as they can easily burn), approximately 3 minutes. To plate, spread labneh on the bottom of a platter or wide serving bowl. Place broccoli and citrus on top. Sprinkle pine nuts over, and zest lime on top. Season with salt and black pepper. A bowl of hot soup soothes the soul in ways few foods can. Even the process has a calming effect. 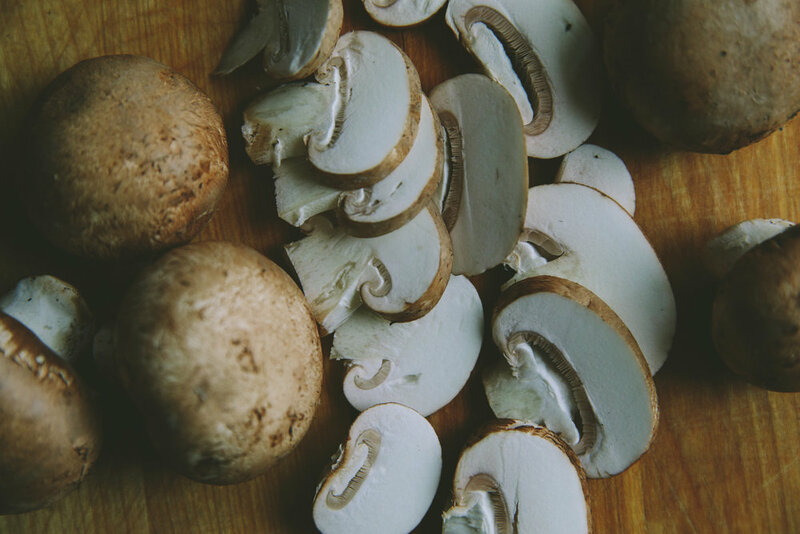 The peeling and chopping of vegetables, the smell of them sautéing, the steam that escapes as it simmers on the stove. I find the whole experience comforting. I've made many batches over these last couple of months to serve to dinner guests (anyone else exhausted from all the holiday gatherings?). 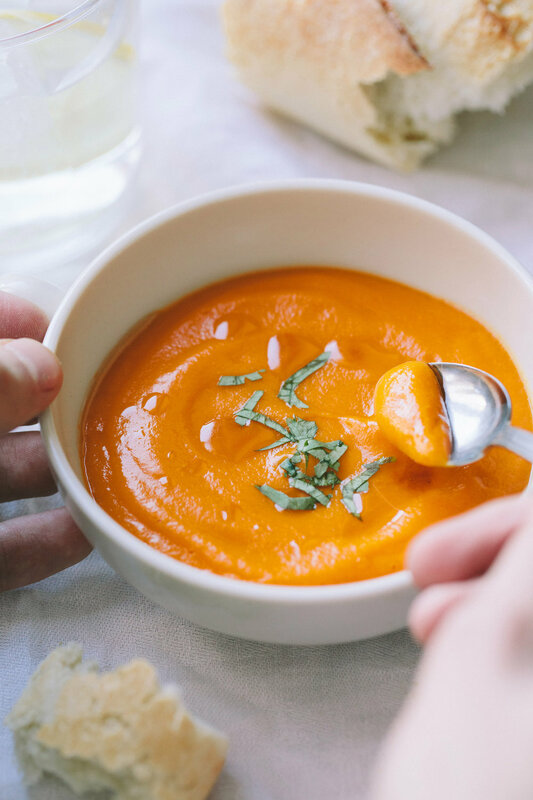 This carrot soup was for our friends who just had a baby a few weeks ago. We spent the afternoon at their home, cuddling with the little one, who slept soundly in my arms until she was ready for more food or wanted to be changed, all things I could pass her off for her mommies to do. It made my heart soar to see how happy the two of them are with their new addition. I'm looking forward to this coming year and all the dishes I have rattling around in my head. To be honest, things felt a bit disjointed over these last twelve months. There was a lot to juggle... the Cape house, work, travels... and I found it challenging to focus. But I'm feeling like this soup is the right direction. Cooking the things I love to eat and just sharing that with all of you. Here's to a great 2018! Cheers! Heat olive oil in a medium-sized pot over medium heat. Cook onion for 3 minutes, stirring often, until. Add garlic and ginger and cook for 2 minutes. 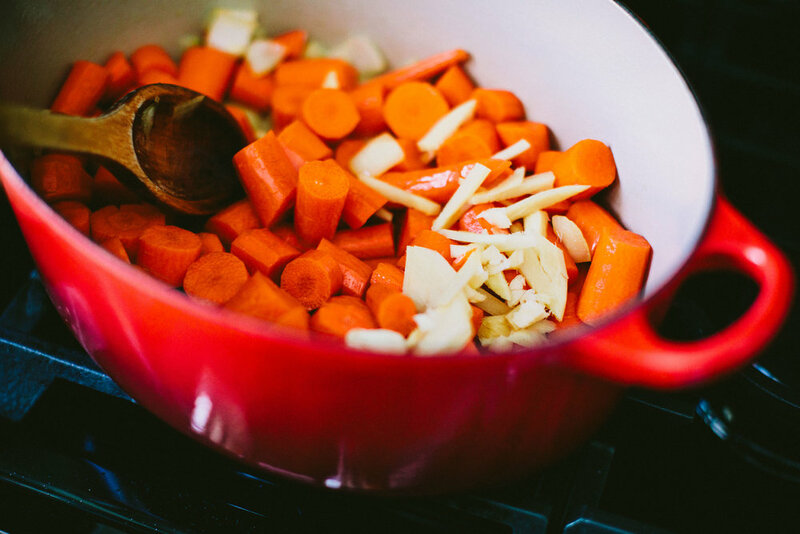 Add chopped carrot, cover with 4 cups vegetable broth, and bring to a boil. Once it comes to a boil, cover with a lid and reduce heat to a simmer. Cook for 25 minutes, or until the carrots are tender. 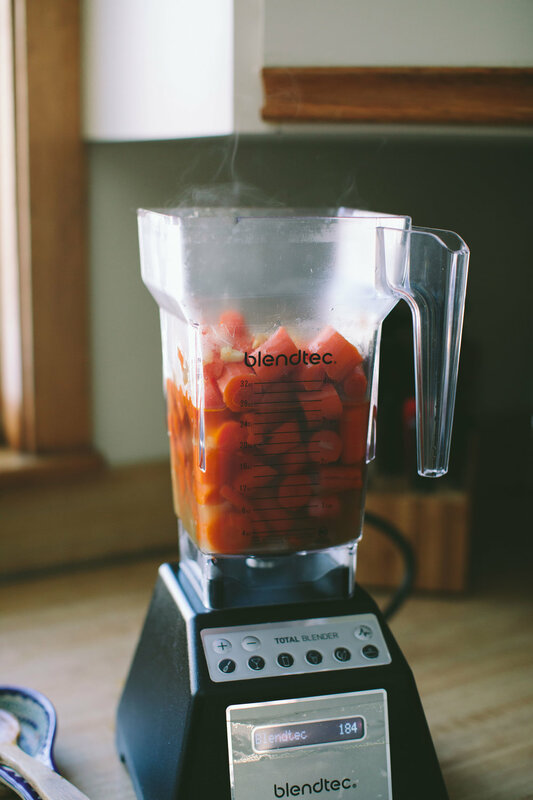 Transfer the soup contents to a blender (or use an immersion blender) and blend until smooth. Add miso and maple syrup and blend to incorporate. Taste for seasoning and, if necessary, add salt. Transfer the mixture back to the pot. The soup will be on the thicker side, but you can thin it out with another cup of vegetable broth. Serve in bowls with a light drizzle of sesame oil and chopped cilantro on top.